Hi guys ! Welcome to our new Tip name ‘How To Permanently Delete A Facebook Account?’ and “How to delete FB Account permanently without waiting 14 days?“. It is a essential tip that everyone must know. We knows that everybody use facebook for different kind of work. From the third class to the first class all types of people use facebook. Now facebook is a part of our life. We can’t spent a day without it. It’s doesn’t matter we use facebook for what but it’s true that we use facebook. A facebook id is very important for a user. A user never want to loss his facebook id. I am also a user and I’ll never want that. When a user don’t want to use facebook than what must he do ? Of course he’ll never want that somebody will hack his profile. That’s why facebook has a option to delete your ID permanently. Temporary Deactivate facebook ID is another thing. If you want to Temporary Deactivate facebook ID. If you don’t think you’ll use Facebook again, you can request to have your account permanently deleted. Please keep in mind that you won’t be able to reactivate your account or retrieve anything you’ve added. Before you do this, you may want to download a copy of your info from Facebook. Then, if you’d like your account permanently deleted with no option for recovery, log into your account and of course I am giving this bellow for more easier to you. 1. Login to you account what you want to delete. 2. Go top right side corner and click. I am giving picture before. 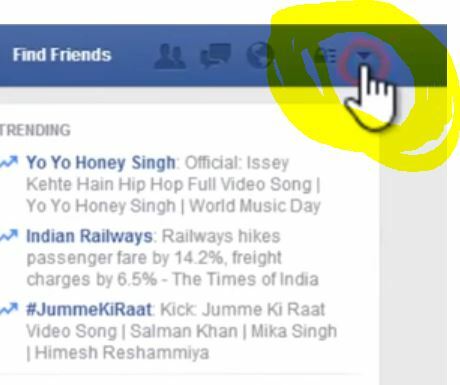 4.Click on the link at the bottom of the main menu that says “Download a copy of your Facebook data”. 4. Then you need to go to https://www.facebook.com/help/delete_account, click on “Delete my account”, then follow the steps to confirm. After two week or 14 days your facebook will be deleted. When you will log in again, a new pop-up appears. It say to either to “Cancel Deletion” or “Confirm Deletion“. Now again the choice is yours, “Cancel Deletion” if you want to come again or “Confirm Deletion” if you still stick with your decision. Never login again next 14 days, if you are sure you wish to permanently delete your account. Must log out of anything connected with Facebook. It may include any app or service that you’ve connected or logged in. It may be calender app, Instagram, Spotify etc. on your smartphone. Clear your browser’s cache and cookies from your desktop, smartphone and tablet. Otherwise, saved login credential on your respective devices will trigger account reactivation. If you’d like to delete a different account, click the username in the top-right of the Delete Your Account page and select Log Out. Log back in as the account you want to delete and follow the directions above.